Orders had been issued with regard to this historic decision, through a notification on 07 November 2015 by the Department of Ex-Servicemen Welfare (ESW) of the Ministry of Defence. Then within just three months of the issue of these orders, the Department of Ex-Servicemen Welfare (ESW) brought out detailed OROP tables on 03 February 2016, which are also available on their website www.desw.gov.in. The 101 tables in these implementation orders contain revised pension of different ranks and categories. In the past implementation of CSC-2012 and 6th CPC had taken a longer time. More than two-thirds of the Ex-Servicemen have now been paid the OROP arrears. Payments have now reached the accounts of 13.02 lakh pensioners amounting to about Rs. 2,293 crore. This amount has been released through Defence Pension Disbursing Offices (DPDOs), the State Bank of India (SBI) and the Punjab National Bank (PNB). As on March 17, the DPDOs have released an amount of about Rs. 606 crore to about 3.20 lakh defence personnel. The SBI has as released upto March 17 an amount of Rs. 1,337 crore to 7.75 lakh pensioners which includes Family Pension cases. The PNB has released as on March 17, an amount of about Rs. 350 crore to about 2.07 lakh pensioners which includes Family Pension cases. 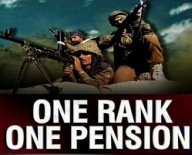 Other Banks who have also been assigned the task of disbursement of revised defence pension to Ex-Servicemen have been directed to complete the process of payment latest by March end.